IF YOU CAN’T STAND THE HEAT GET OUT OF THE ‘KUCHEN’! No bull – just durable tools and storage solutions from Matador. 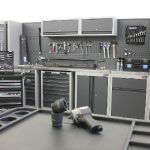 Yes, we know that the ‘Men’s Kitchen’ title might have lost something in translation – after all, just as many female technicians would love to own one of these tool storage solutions from the German purveyors of high-end, yet surprisingly affordable modular ‘kitchen’ blocks, as the blokes out there might. Let’s face it, gender-specific torque wrenches, impact guns or socket sets don’t exist, and they certainly don’t mind who’s using them when they are living a charmed life inside a Matador Toolbox. The key selling point for the Matador range is its modular and expandable construction and setup. Thanks to Matador’s sales logic it’s possible to start small and grow big, a bit like an acorn. Or just jump in at the deep end, order the full oak and a have a 4m long behemoth at your disposal from the get-go. With five possible configurations available ranging through Piccolo, Compact, Medium, Mobilo and Grande, the order process is almost the same as selecting your favourite coffee from the high street, albeit with a more hands-on end goal in mind. The pre-configured “kitchen” blocks allow a well-considered and complete workshop arrangement without spending much time planning or having to assemble the units when they arrive. Simplicity if the key, see. Standard draw dimensions allow you to include the professional Matador module system (MTS) into the configuration so that all single tools will be kept in perfect order thanks to specially lined foam trays. Ball bearing drawer rollers can also cope with up to 45kg of load, and the overhead lockers come with gas struts to make opening and closing that much easier. Thanks to drawers and cupboards for power tools, storage boxes for all your individual small parts and Matador’s extensive program of accessories you can easily design and evolve any Men’s Kitchen to suit any need. A durable powder-coated finish in subtle light- and dark grey, high load capacity and solid metal construction make them a classy fit for almost any room. 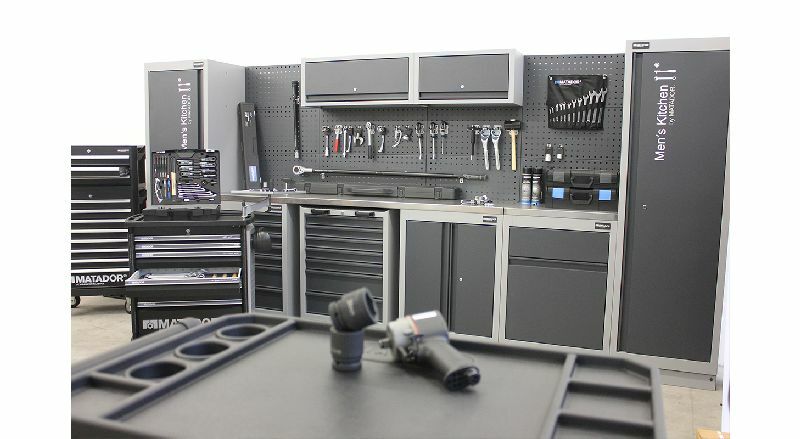 In fact, the Men’s Kitchen range of toolboxes has already appeared in numerous VAG, Mercedes-Benz, Porsche and BMW dealerships throughout Germany. That same subtle, effortless branding that major motor corporations approve of obviously adheres perfectly to Matador’s brand values. Simplicity is said to be the key principle for all Matador products, and thanks to the modular system you can expand as your tool collection and projects flourish. Starting with the Piccolo (1276mm x 1980mm) it comes with a three-drawer adjustable drawer cabinet, seven drawer cabinet, beech wood or stainless worktop and perforated back panel for accessory mounting. The Compact (1956mm x 1980mm) builds upon this base unit adding a further perforated panels space at the back, a much wider workbench area, another overhead cabinet and a further closet with adjustable shelves. However, it’s with the Medium (2817mm x 1980mm) that things start to look very serious indeed as a further 861mmseven-drawer tool chest joins proceedings along with a whooping 2215mm beech or stainless worktop and a further overhead cabinet. For many this may be the sweet spot as getting close to 3metres in length it’s nearly ten-foot long, but there is an alternative in the form of the Mobilo version. Identical to the Medium but with a mobile tool chest on wheels that occupies the middle slot that can be easily manoeuvred around any workshop with simplicity, it’s the perfect solution if you need a selection of tools at hand. If you’re of the mindset, “go big or go home,” let us introduce you to the Grande (4089mm x 1980mm). As the title suggests it’s the big daddy of the range and there’s no point beating about the bush, it’s massive! Larging it has never looked more stylish though and should lend enough storage space for an entire workforce, never mind an individual! Ultimately, the “Men’s Kitchen” isn’t about fancy thrills or clever tricks, just hard work, durability and a clear head space where all of your tools are safely stored and easily accessible for years to come. Thanks to the freestanding construction of the range there’s no need support or wall mount them in anyway. More than just a storage solution, the “Men’s Kitchen” range is a place where everyone will be inspired to create new things and where the motivation to ‘get the job done’ will be at an all-time high. Prices start at £1673 inc VAT for the Piccolo. Print article This entry was posted by admin on January 25, 2019 at 10:58 am, and is filed under News. Follow any responses to this post through RSS 2.0. Both comments and pings are currently closed.